Turns out the recipe for Meraki's special sauce is simpler than you thought. Cisco's Meraki offices in San Francisco reflect a philosophy that aligns with the company's beliefs on quality and simplicity. With pod desks, coffee bars, mini golfing and colorful yurts spread across the floors, Meraki lets physical space speak loudly to the team's philosophy of creativity and innovation. The Cisco Meraki solution works to make IT systems that are easy to deploy, monitor, and manage. The company's suite of solutions covers networking, security, mobile device management and more—that are all managed through the cloud. And although the company was acquired by Cisco in 2012, Meraki makes it a priority to stay close to its startup roots. Beyond the tech spectacle of the offices is a story about entrepreneurship and simplicity—one about "Merakifying", a word Cisco CEO Chuck Robbins uses to promote transformative work and positive growth. Meraki is just one of many acquisition success stories. Cisco has completed dozens of acquisition integrations, with emphasis on market acceleration, market expansion and new market entry. With companies like Acano Limited, OpenDNS, Jasper and Tropo, Meraki shows us just a small glimpse into Cisco's overall acquisition story. 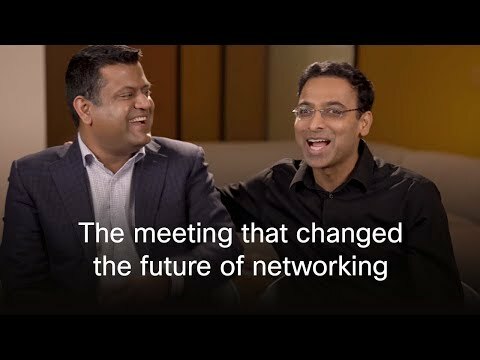 And much like Cisco itself, the IT company prides itself on being the future of work. Cisco's other offices share a similar style of an innovative workspace—Building 10 in San Jose, California concentrates on the idea of the future of work. The networked-space is equipped with video conferencing rooms, virtual front-desk assistants, and digitally-managed ceilings. The streamlined, fresh walls of Cisco's offices were also created for the purpose of collaboration. Chris Stori, Cisco VP and Chief Operating Officer for Cisco Meraki, knows the improvements that can be made when you create with intention. Stori shares an anecdote about one of Meraki's designers who decided that they wanted to conduct a passion project on the side. Using a wood laser cutter, the designer created wooden nametags—including pictures—for each employee. These nametags all hang as wall art near the entrance of the offices. "It's an art project, but with a purpose," says Stori, "It's about highlighting our employees." Like everything in Cisco Meraki's offices—every detail in the space—the physicality serves a purpose that continuously drives back to culture, employees, and customers. "At Meraki, we believe that by simplifying powerful technology, we can free passionate people to focus on their mission .."Cisco Meraki's mission is to simplify IT, and through that, help others help themselves. "At Meraki, we believe that by simplifying powerful technology, we can free passionate people to focus on their mission and reach groups previously left in the darkness," says Todd Nightingale, Cisco SVP and General Manager at Cisco Meraki. This simplification strategy caught Cisco's eye—and since the acquisition of Meraki in 2012, it has seen more than eight times an increase in its customer base. "Cisco saw that Meraki had a valuable offer and saw that there was a market trend towards simplification," says Pablo Estrada, Director of Marketing, "Meraki was leading the way as an independent company. We had end to end focus on simplification and a great customer experience." The laser-sharp focus of an independent company had created a culture of moving quickly—one that employees were eager to jump on board with. The product development has been very strong and fast," says Estrada, "One of the things that we were looking to maintain through the acquisition, and we have, is our ability to develop products quickly and adapt them quickly to customer needs." Teams at Cisco Meraki are purposefully kept small. Pods of employees sit back-to-back or side-to-side so that the flow of communication is always open. Not only desks, but bathrooms, cafes, coffee bars, and meeting rooms are all placed strategically to help foster run-ins and collaboration. Dogs roam around the offices, and employees can take a break from their standing desks to play a round of ping-pong or practice the banjo in their dedicated soundproof music room. The energy of the floors is infectious and buzzing. "People feel a certain joie de vivre when they're here," says Stori. And it's clear that the exuberance of Cisco's Meraki office is seeping through every aesthetic—transparent meeting rooms, vibrant colors, and wood-based, earthy architecture. "There is an expression of liveliness and excitement," says Stori, "If you walk around, you'll see lots of people on headsets. You can pick up employees just stewing in this ambient culture here of ‘Oh, they did a demo this way. I could totally use that with this customer.' This constant learning environment is built around this energy." Designed for a purposefully "startup" culture, Cisco's Meraki offices house small, collaborative teams created to invest in mutual accountability and trust. The term "Merakify" has been an amorphous concept to the company's leads. It's something that has taken on a life of its own and even become a Twitter hashtag. To Cisco's CEO, this term is an aspirational take on the acquisition's tremendous growth. "Growth has just been so impressive since the acquisition," says Estrada, "When Meraki was acquired at the end of 2012, we had about 15,000 customers, and today we have over 120,000 customers. So that's more then an 8 times increase in our customer base, our customer footprint." To Stori, Merakifying is an idea about energy, company culture, and even the ability to say no. "Merakifying to us is being focused on mission, staying simple, staying nimble, and keeping it fun and energetic. I think you can do a lot of those things, but sometimes you can't do it all," says Stori. Estrada says that customers of every size have been very receptive to the idea of simplification. "We found that large customers and small customers both want to simplify their operations and take advantage of the cloud and have some of those benefits," says Estrada, "The product development has been very strong and fast. One of the things that we were looking to keep through the acquisition is our ability to develop products quickly and adapt them to customer needs." Together, Cisco and Meraki have been able to work together in creating the best version of the company possible. Simplicity returns as one of the main concepts in the Cisco Meraki story. In the end, the simplification of technology helps customers be the absolute best at what they do. "The idea of ‘Merakifying your mission' is giving back the time for passionate people to focus on what they do," says Stori. Cisco Meraki's offices operate much in the same way, as if Merakifying means creating a space and environment where employees can be the best at what they do. Whether it is meeting in a collaborative pod, chatting in rooms built to promote transparency, or lounging in your own private yurt—the offices reflect what it means to give the best so that people can be the best at what they do.